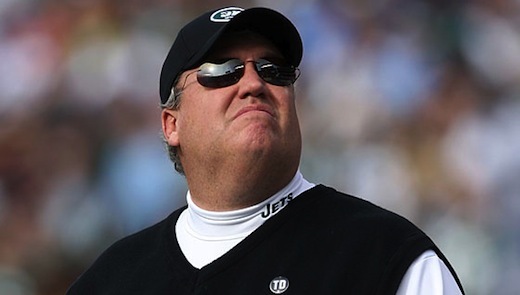 One of the best all-around teams in the NFL over the past two seasons has been without doubt the New York Jets. With flamboyant and outspoken head coach Rex Ryan calling the shots from the sidelines, quarterback Mark Sanchez improving with every game under center and the defense being amongst the league’s elite, the New York Jets are a legitimate Super Bowl title contender every single season. Obviously, the New York Jets have their eyes on the prize once again heading into this upcoming NFL regular season with a Super Bowl title in their crosshairs. Even though the New York Jets didn’t make blockbuster trades or free agent signings like the Philadelphia Eagles did during the offseason, Rex Ryan and company did bring in some players that will definitely help this team moving forward. Perhaps the best move the Jets made in free agency was re-signing former Super Bowl MVP wide receiver Santonio Holmes. With Holmes back for at least the next five years, Sanchez will have that go-to guy in the passing game, but he will also have some veterans to throw to in Derrick Mason and Plaxico Burress. The New York Jets neglected to bring back free agent wide receiver Braylon Edwards (San Francisco 49ers) and chose to go with Derrick Mason formerly of the Baltimore Ravens and Plaxico Burress formerly of the New York Giants. Burress may be a gamble since he hasn’t played in two years, but still a solid athlete in the passing game at the second or third option. Mason is an aging wideout past his prime, but also a solid option for Mark Sanchez in the offense. All these new faces for the New York Jets will come together to start the preseason on the first Monday Night Football game of the year against the Houston Texans at Reliant Stadium in Houston, Texas. Last season was a promising look at things to come for the Houston Texans as they quickly became a legitimate threat to dethrone the Indianapolis Colts in the AFC South division. With running back Arian Foster coming to life in the Texans’ backfield, the Houston offense was near unstoppable with the passing game amongst the best in the league led by quarterback Matt Schaub and perennial Pro Bowl wide receiver Andre Johnson and the running game turning into one of the league’s elite led by Foster. Whether or not the Houston Texans can keep their foot on the gas pedal this season and finally make it into the playoffs remains to be seen, but things are definitely looking up in Houston and as long as they can stay healthy they will be a threat to win the AFC South division title. Unfortunately, Arian Foster will not be playing on Monday night against the New York Jets as he has gone down with a hamstring injury. This injury could keep him out of the preseason, but he should be ready for the regular season next month.